Harry Jack: letter to Backtrack in Volume 11 page 460 Writer would like to believe that the locomotive building records of Edward Bury & Co. still exist somewhere, but the recurring story that they went to the United States in the 1890s is probably just another myth put about by that irrepressible railway writer, Clement Edwin Stretton (1850-1915). who published hundreds (perhaps thousands) of articles and letters and several books about railways and locomotives, but most of his work is misleading  or quite worthless  because so much of it is fiction. What he did not know, he simply made up. He was involved in the preparation of railway exhibits for the 1893 Columbian Exposition at Chicago and claimed that Bury's books and working drawings were sent there. As "there was a very great probability of these interesting records being lost to this country" he said he had made copies of them. But, from drawings and details of Bury engines which Stretton subsequently published, it is obvious that his information was not authentic and that, as usual, much of it came from his fertile imagination. He also claimed that the originals were then deposited in the Field Museum at Chicago. Enquiries to the Museum and to other likely sources in America have produced no information at all. It is difficult to believe that the Bury archives, which must have contained original material about several of America's first locomotives, could have simply disappeared in a land where there are so many knowledgeable researchers into railway history if they ever were in Chicago. On page 689 of the same Volume of Backtrack Jack returned to the attack noting that as early as the 1890s G.A. Sekon of the Railway Magzine was questionning the veracity of some of Stretton's statements. Rutherford considers the unreliable Stretton in his correspondence concerning CR No. 123 where Stretton "knew better" than the man responsible for designing it! (Backtrack 13 200). Ottley who was normally extremely cautious noted on the huge entry for 5592 that "As sources of information these popular lectures are incomplete and unreliable. [KPJ added the bold]. There are six editions of his Locomotive engine and its development Ottley (2837). The entry by (Simmons) in the Oxford Companion borders on the wildly generous and should therefore cast some questions about the reliability of Simmons and of the Companion in particular. The work of Clement Edwin Stretton (1850-1915) comes into an altogether different category, and if only to forestall readers' perplexity, some words of warning must be given. This prolific author wrote a popular book on locomotive history which, although filled with errors, [KPJ's emphasis] ran to six editions between 1892 and 1903; he also published hundreds of quite unreliable pamphets and articles on railway and locomotive history - reference libraries throughout the land are stuffed with them. The various periodicals covering railways contain scores of his didactic letters between the 1880s and 1914. His manner towards anyone who questioned his version of events was overbearing; he was quite irrepressible. But he was often wrong, because whatever he did not know he simply made up. Much of his writing about railway history, although it is always decked out with vivid and memorable details, can now be recognised as fiction. His stories about the two LNWR Southern Division locomotive superintendents, Edward Bury and James Edward McConnell, give a completely false impression but it is one which has coloured most writing about the subject for the past hundred years. His account of the Chester & Holyhead engines, which were transferred to the Southern Division and which he claimed to know all about, was accepted for a long time but can now be seen for the nonsense it always was. He concocted many bogus works lists (such as one which claimed to enumerate the locomotives built by Bury, Curtis & Kennedy) and produced quite inaccurate drawings of engines, some of which he foisted on the Science Museum; his absurd drawing of Southern Division H class No 373 was reprinted in two books as recently as the 1980s. In all cases he announced that his sources were official and authentic. He published so much and gave himself such an air of authority that his work will continue to be 'rediscovered' by researchers, and will continue to spread confusion. Maybe I have unwittingly included some Strettoniana in these pages; I hope not. Unfortunately Backtrack, 2005, 19, 218 includes a brief contribution by J.D. Bennett who has either failed to read the Magazine to which he contributed or chose to ignore it (both of which are serious failings) and goes yet further by implying that Stretton on locomotives may be less unreliable than on other aspects of railway history!! It is to be hoped that the portrait reproduced is of Stretton and not of someone else. The cover of the book on locomotives reproduced hereat is red and should be an awful warning to potential purchasers who presumably pay fancy prices for such rubbish. Letter from Stephen Duffell (Backtrack, 19, 444) in response to this spares no punches and notes that G.A. Sekon was well aware of the deficient nature of Stretton's contribution before the end of the nineteenth century. Also suggests that his donations to the Leicester Museum may have skewed things still further. Specifics mentioned by Duffell are the character assassination of Edward Bury by this "opinionated and arrogant man" and the distortion of the history of the Vulcan Foundry. Nevertheless, Brian Orrell (Backtrack, 19, 574) does provide some mitigation concerning the Vulcan Foundry records and notes the hostility between Sekon and Stretton (Stretton had ensured that Sekon would not be elected to the National Railway Museum Committee in 1896). Stephen Duffell returned to Stretton in an article entitled: Clement E. Stretton: railway engineer, historian and collector. J. Rly Canal Hist. Soc., 2005, 35, 162-9. He considers that Stretton was a man of independent means who was committed to life in Leicester where much of his source material is stored in the Central Library. Duffell noted that Stretton campaigned strongly in defending railwaymen against their employers when they were taken to court for being involved in fatal accidents. For a time Stretton acted on behalf of ASLEF as noted by McKillop in The lighted flame. Jack, Harry. Clement E. Stretton. J. Rly Canal Hist. Soc., 2006, 35, 444-5. Mainly Stretton's "Extra-large Bloomer", but also notes Stretton's other "inventions". Lewis, Brian Clement E. Stretton. [letter] Rly Arch., 2008 (19) 70. Stevens, Philip A. What happened in the tunnel? a study in railway mythology. J. Rly Canal Hist. Soc., 2004, 34, 561. Stretton in his History of the Midland Railway may have invented an event on the opening day of the Leicester & Swannington railway by suggesting that the chimney was knocked off the locomotive in Glenfield Tunnel. The author could find no record of thie happening in contemporary press accounts. The development of the locomotive. London: Bracken Books, 1989. A further insight into Stretton's character, and that of Sekon, Greenly and other earlier commentators on locomotive history is given on the Greenly page. Jack Simmons in the Oxford Companion notes that he was lived from 1850 to 1915 and was educated at Rugby (presumably at some other educational establishment in the town). He states that he was trained as an engineer and became a consultant. He set up the Leicester railway musuem. 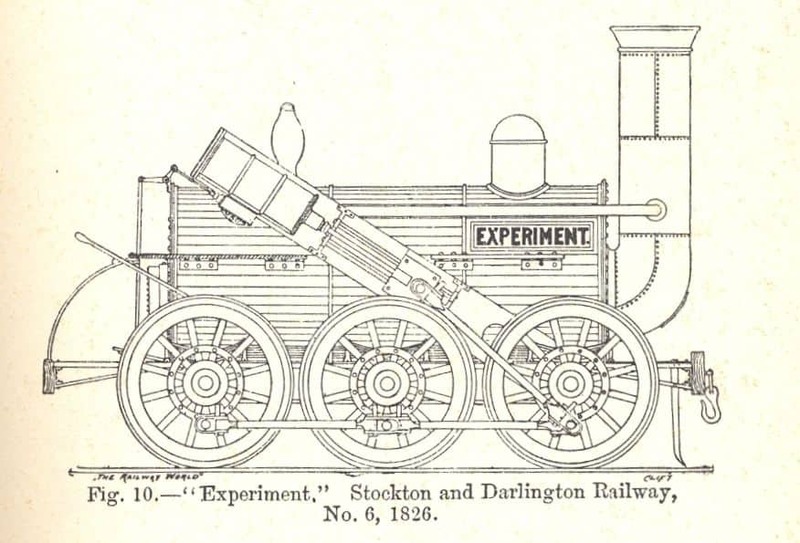 "The imaginary drawings of this engine (by, the late C. E. Stretton) hitherto widlely published, copies of which are to be seen at Faverdale Exhibition, are incorrect in every respect." The illustration is taken from the book by Stretton which is cited above. The Warren reference is J. Instn Loo. Engrs., 1925, 15, 515. Claussen, Pete. Edward Bury's first sixteen locomotives: untangling the historical record. Backtrack, 2018, 32, 620-3.